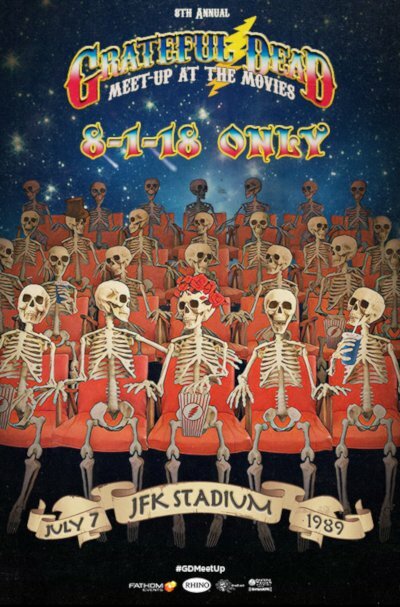 The Grateful Dead returns to cinemas this summer for its highly anticipated annual event, "8th Annual Grateful Dead Meet-Up at the Movies." For the eighth year in a row, a special concert presentation will bring fans together across the country for a unique celebration of the band. This year's concert is a presentation of the July 7, 1989 show from Philadelphia's John F. Kennedy Stadium, and highlights the band's exuberant resurgence, a peak that rivals any that came before it. When this show was recorded, the band included guitarist Jerry Garcia, drummers Mickey Hart and Bill Kreutzmann, bassist Phil Lesh, keyboardist Brent Mydland and guitarist Bob Weir. It marks the final concert at that historic venue as the band storms through an epic set on one of the hottest days of the summer. In addition to the concert, which captures every note of the epic show, attendees will also get an inside look at the 2018 Limited Edition Boxed Set. 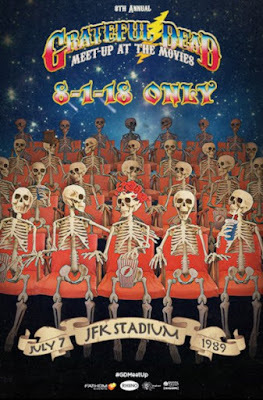 Tickets for "8th Annual Grateful Dead Meet-Up at the Movies" can be purchased online at www.FathomEvents.com and participating theater box offices. For a complete list of theater locations, visit the Fathom Events website (theaters and participants are subject to change). "For nearly a decade now, fans have looked forward to the summer to get together with 'family' in movie theaters across the nation for the annual 'meet-up,'" Fathom Events CEO Ray Nutt said. "We're proud to partner with Rhino again this year to bring this special event, featuring one of America's most treasured rock bands, to some of the world's most devoted fans." The Philadelphia concert offers a snapshot of the Dead's 1989 tour, where the band played to some of its biggest audiences ever, a result of the group's only Top 40 hit, "Touch of Grey" from 1987's In The Dark. During this tour, the band was recording the follow-up to that album, Built To Last, which is an important reason why the jamming heard here is particularly fluid and concise. In fact, the band played a pair of songs from the upcoming album, the aching ballad "Standing On The Moon" and the poignant "Blow Away," a song co-written by keyboardist Brent Mydland, who sadly died a year later. The show closed with another Dylan cover, "Knockin' On Heaven's Door," the last song ever performed at JFK Stadium.